Nancy was a stranger, but we were sitting in her dining room eating chicken wings and toasties. After a jarring drive over unpaved mountain roads we had arrived too late- both in hour and in season. The lodge was empty, dark, and locked. By chance we saw one lone figure standing on a corner and walked over. That silhouette under the street light was Nancy and she brought us into the warmth of her home. While she was in the kitchen calling someone from the lodge, we washed her food down with hot cups of tea. “They’ll be around shortly and then you can head over,” she told us in a New Zealand lilt. 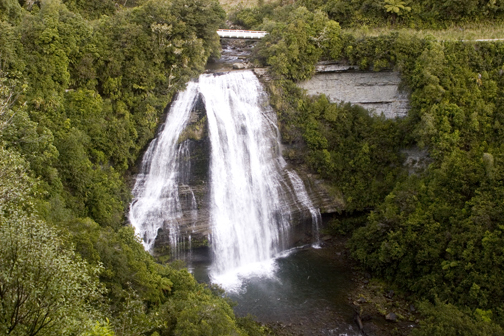 Tuai was a small Maori community, and in some way or another, the person she had called was family. 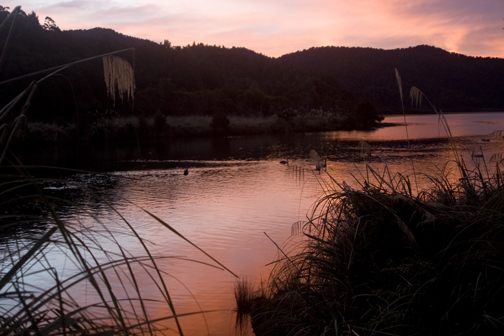 The next morning we left our car in a secure area and caught a ride to the southern end of Lake Waikaremoana. The steep uphill climb to Panekiri Bluff was the hardest part of the whole walk and we weren’t used to hiking with four days worth of food on our shoulders. 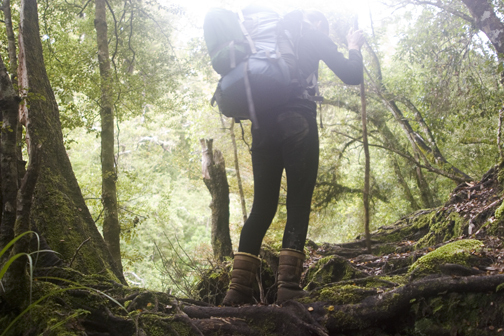 Our unhurried climb didn’t feel too slow until we met the girl who passed us. She was a pragmatic German who had started two hours after us and arrived at the hut two hours before us. My only consolation was that while we were eating ginger candy and enjoying the scenery, she was squatting in front of the hearth unsuccessfully starting a fire. The second day we descended into the quiet of the forest. Most of the track was a staircase of tree roots, but in some parts an abundance of summer rain had carved deep luge tracks through the earth. We wound down through the tall green ferns and out onto the lake shore an hour before the sunset. Black swans bobbed under the surface as the water rippled around them. 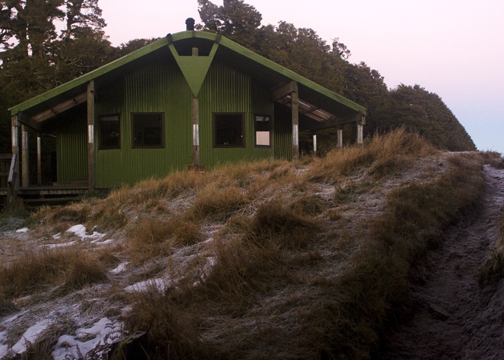 From the Waiopaoa Hut, we watched rich pinks and royal purple hues gently flood the sky. When the stars appeared, the lure of a crackling fire drew us back inside. We cuddled and drank tea, both of us mesmerized by burning red branches when suddenly a noise pierced the evening calm. Loud voices from across the lake faded in and out like a bad radio reception. For a good half hour we felt like sitting ducks with the guillotine looming over our heads. Bang! Clump CLUMP! Bang! HA ha! Slam, clump, Oh my!! Made it! SLAM. The teenage blade had dropped. Kids squealed with delight as they threw off their backpacks and groped about the dark cabin. Bright headlight beams blinded us and an army of gas burner flints sparked in unison. “I better open a window…” Barret glumly said as he surveyed the scene. As I sulked against the wall of the dining room, a young lanky boy approached us. After falling asleep to the sounds of Greco Roman wrestling, we left in the morning without eating breakfast. It was a misty day and our path began with a flat muddy track around the lake shore. Stray sticks had been thrown across some of the small squishy pits, but we encountered one so large and deep we had to pause. With a moment of brilliant clarity I knew what I had to do. I planted my left foot, grabbed a skinny tree trunk and leaned back to gain momentum. Before I was even halfway through my swing the tree broke and I flew backwards into the cold bog. If I had paid for this in Rotorua I would have been ecstatic. But I was cold and dirty and miserable and Barret wouldn’t stop laughing. A little before the beam of my headlight faded into uselessness, we reached the last cabin. It was a large new building, and it seemed menacing under the light of the moon. We quietly tip toed into the sleeping quarters and put our backpacks down before moving to the cavernous kitchen next door. For a second I almost wished we had company to fill all the empty seats inside, but that feeling disappeared as soon as Barret got the fire going. The last day was our short, easy leg; fueled by more trail mix than I cared to eat in a lifetime. 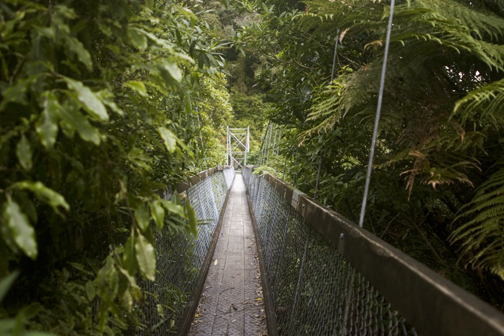 When we reached a bridge that spanned over a wide river, we knew it was the end of our journey. We had walked 28.5 miles. Our feet were sore, our shoulders were sore, our thighs were sore. But even as we waited for the van to pick us up, we couldn’t stop pacing. We’d proven to ourselves that we could complete a four day walk and our minds were full of possibilities! 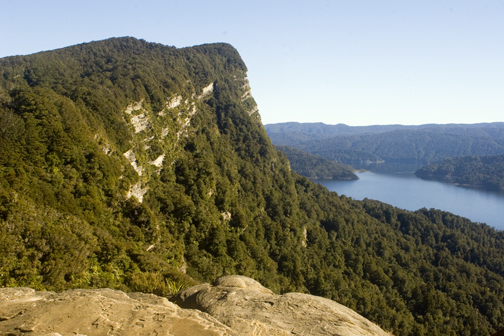 How to get to Lake Waikaremoana: Heading south from Rotorua, State Highway 38 becomes narrow, winding, and unsealed. Heading north from Wairoa, the drive is shorter and paved on most sections. Amazing journey, and so entertainingly written. Great job!